No matter how many times you’ve tried and failed to follow a workable budget, it’s time to try again. Because no matter how many times you tell yourself you don’t need a budget, the truth is that you do. That’s not to say you need a detailed budget with dozens of categories (though that’s certainly an option). But you do need something that instructs your money on how to cover necessary expenses while meeting your financial goals. That something is called a budget. 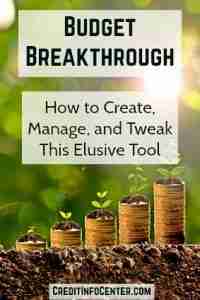 Here’s how to create, manage, and tweak this elusive (but necessary) tool. Some of these things you may already be doing. Others may not apply to you at all. And you may have others to add to the list. When making your financial goals, don’t be discouraged by doubt as to how you’re going to be able to fund them. The point of this step is intention and empowerment – deciding what you want your money to do, not letting your money decide for you. Granted, you may not be able to contribute as much toward these goals as you’d like, but the value is in getting clear on exactly what you want and working toward it. If you’re on a fixed salary, this should be pretty straightforward. If your income varies from month-to-month, it’s obviously more challenging. The longer you’ve been earning this irregular income, the better idea you’ll have of what you should budget for by looking at least year’s earnings. If your work is seasonal, maybe it’s best to go by last year’s corresponding month. You could also use an average of last year’s monthly earnings or use the lowest-earning month as a baseline. For an even more comprehensive list of possibilities, take a look at Mint’s budgeting categories. But if you prefer a simpler budgeting system, you could have far fewer categories. For example, if you go with the 50-20-30 percentage budget (more on that later), you may limit your categories to 1) essentials (50 percent of your take-home pay), 2) financial goals (20 percent of your take-home pay), and 3) discretionary spending (30 percent of your take-home pay. NOTE: Obviously, you won’t have every possible expense every single month. For those categories for which you had no spending over the 30-day period you’re tracking, use last year’s spending in those categories to come up with a monthly average (if you don’t have the exact figures, estimate). You won’t spend that monthly allotment every month, but you can (and should) contribute that much to a fund for covering those expenses in the future. Good examples are spending on gifts, home and car repairs, back-to-school expenses, and medical expenses not covered by health insurance. The goal, of course, is to spend less than you earn. If you discover that you’re spending more, you know you need to cut back. But even if you’re spending less, that’s not to say you’re spending right. The point of a budget is to make sure you’re spending in a way that not only ensures that all of your bills are paid, but that you’re funding financial goals that are important to you. The point is to move as much of your income as possible away from spending so you can funnel it toward your financial goals. Whichever allotment of spending you choose – be it one of these or your own variation – what’s most important is that you have a plan for your money so you know exactly where it goes. However you decide to budget your money, make sure you budget all of it. This is known as zero-sum budgeting, meaning you’re left with zero because every dollar has been “spent” on expenses, debt, savings, or investments. Because if you’re not telling your money what to do, it’s not working for you. Learn more about zero-sum budgeting. Is it free? There are too many free options for you to have to pay for one. Does it connect to your financial accounts? If so, it will automatically log your activity on bank and credit card accounts. Keep in mind you’ll already have to manually input any cash transactions, so this is an important time-saving, user-friendly feature. The best options that meet both of these criteria are Mint and LearnVest. If you don’t love either one of those, check out YNAB. It’s a paid app but offers a free trial. If you like it, pay $5 a month or $50 a year. You may prefer managing your budget with personal finance software (like Quicken), Excel spreadsheets, or a budget binder. Automated transfers to savings. No matter how committed you are to a savings goal, you run the risk of falling short if every month you’re faced with the choice of saving or not. Take the decision out of it (or forgetting altogether) with automated savings. Only once do you have to pick a monthly savings amount, and the date you want it to come out of your checking account. If you already have a savings account attached to your checking, it’s simply a matter of adjusting the date and amount to meet your savings goal. Otherwise, talk to your bank about getting automated savings set up. Automated payments. If your savings isn’t automated and you forget to make the transfer, the only person you have to answer to is yourself (and possibly your spouse). But if you forget to make a payment, you have a company to answer to, which will likely mean a late fee that unnecessarily sabotages the success of your budget. So for recurring bills, take advantage of automated payment options that you can set up either through the company or your bank. This isn’t intended for all of your expenses; only the ones for which you can easily 1) go over your budget and 2) pay with cash. For instance, you wouldn’t use the cash envelope system for mortgage or rent payments, insurance payments, utilities, cell phone payments, or credit card payments. What you would use the cash envelope system for are things like groceries, eating out, gas, movies, and clothes. What’s really driving your financial decisions? Find out. 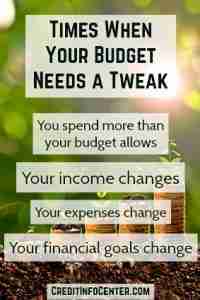 Beyond that, make it a habit of revisiting your budget at least once a year. An expense you have today may seem unnecessary 12 months from now, especially if that extra money can go toward the financial goals that you’re getting closer to achieving with every passing week, month, and year.